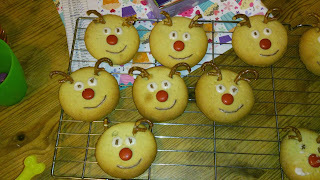 Today James wanted to do some making so keeping with the christmassy theme we made reindeer biscuits!!! They were simple to make and even more fun to decorate! - Preheat your oven to 180 degree C and then line a baking tray with grease-proof paper. - Cream together the butter and sugar (I find it easiest to use an electric whisk for this) Then add the egg and vanilla extract into the butter and sugar and mix well. - Now gradually add your sieved flour into the mixture and mix well until it forms a dough. - Place your dough on to a well floured surface and roll it out until it is just under 1cm thick. Now cut out your biscuit shapes, I used a round cutter to form the reindeer face but you may wish to use a different shape. - Place your cut out shapes onto your pre-prepared baking tray and prick them with a fork several times then place into the oven for around 12-15 minutes. After around 6 minutes in the oven remove the tray from the oven and place to pieces of broken pretzel in the top of the biscuit to form the antlers. Place back in the oven for the remaining time and until golden brown. - When cooked leave to cool on a wire rack and then add your decoration. 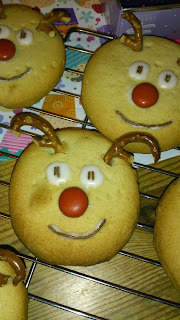 We used red smarties for Rudolph's nose and royal icing and chocolate sprinkles for the other features. You can use whatever you like to decorate yours! We had lots of fun making these and I think they would make a fab treat for your little one to leave out for father christmas on christmas eve! I hope you are all having a lovely weekend! Are you doing anything Christmassy? ?